Ibogaine is a relatively unknown psychedelic drug that has been gaining more popularity and attention as a treatment for addiction. Because of its unique interactions in the brain, there is really no other drug in the world that operates like Ibogaine does. But, what is Ibogaine exactly? In this guide, we will take a look at what Ibogaine is, its history, previous uses, discovery as an addiction treatment, and how Ibogaine is currently being used around the world to treat severe addictions to drugs like heroin, opiates, meth, cocaine, and alcohol. 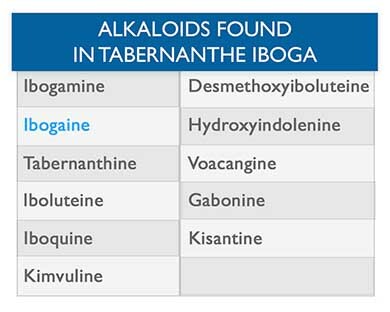 Ibogaine is just one of many alkaloids that can be found in the root bark of the Iboga, or Tabernanthe Iboga, plant found in western Africa. Traditionally, the root of the Iboga is removed from the plant and the bark is ground up into a powder that can be consumed. Ibogaine is different than Iboga. Ibogaine is synthesized and extracted from Iboga for medical and scientific use. On a medical level, Ibogaine is much more predictable than Iboga because it does not contain other foreign alkaloids that could alter the experience or the interaction of the drug in the body. Ibogaine was first extracted from the Iboga root bark in the late 19th century. Before this, Iboga, in its pure form, was used by the Bwiti religion of Africa for spiritual enlightenment and religious ceremony. Iboga is the plant, Ibogaine is the extracted medicine. The Bwiti are considered the first to discover Iboga. It is not known for how long the Bwiti have been using Iboga but, likely, it has been centuries. The Bwiti swallow the Iboga in powder form in order to induce a powerful, hallucinogenic experience which they use for rite of passage, healing, and spiritual ceremonies. This video can help give more insight into how the Bwiti use Iboga in their shamanistic and religious ceremonies. 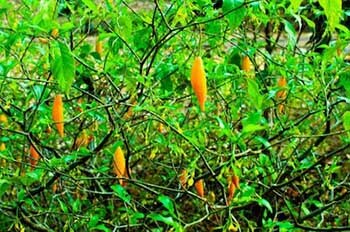 In the late 19th century, french scientists synthesized and extracted Ibogaine from the root of the Iboga plant. This extract was marketed as a product called “Lambarene.” Lambarene was used as a mild stimulant and performance enhancement drug that made its way into the Olympic scene. Athletes used Ibogaine, in the form of Lambarene, to help them perform better during this era. Eventually, this drug was banned from athletic use by the Olympic committee. But Ibogaine had a more powerful effect at higher doses which had some very interesting results, especially on addictive behavior. However, this was not discovered until nearly 60 years after Ibogaine’s advent. 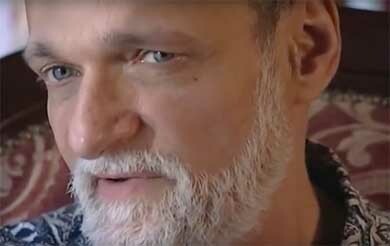 In 1962, Howard Lotsof, a heroin addict, was searching for psychedelic drugs to experiment with. A scientist he knew gave him the extracted Ibogaine and Lotsof ended up on a very long, very intense, psychedelic experience that changed his life forever. However, the spiritual nature of Ibogaine was not the only thing that interested Lotsof. During this psychedelic experience, Lotsof did not take any of the opiates or heroin that he was extremely addicted to. Days passed by, and Lotsof realized that the withdrawal symptoms from not using heroin had still not set in. Normally, heroin withdrawals are tremendously strong and impossible to avoid, but Lotsof, with the help of Ibogaine, had somehow skipped past this withdrawal phase. Being curious, and scientifically minded, Lotsof decided to give Ibogaine to a few of his friends who were also addicted to heroin. 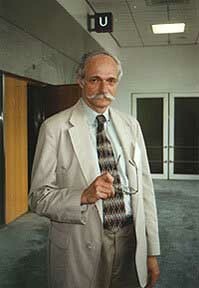 After their individual experiences with Ibogaine, Howard Lotsof found that the Ibogaine had similar results on his heroin addicted friends. Ibogaine had eliminated the withdrawal symptoms that they would have normally encountered. Lotsof continued his schooling at NYU. During this time, massive changes to the legality of psychedelics in the US were underway. By the time Lotsof was able to begin seriously studying Ibogaine and its anti-addictive properties, psychedelics, including Ibogaine, had been outlawed in the US for personal use and scientific study. This forced Lotsof to begin his Ibogaine studies in Amsterdam, where he made breakthrough discoveries and developed the majority of the protocol still used by Ibogaine treatment centers today in their fight against addiction. Since Howard Lotsof discovered the healing properties of synthesized Ibogaine in the 1960s, there have been many Ibogaine clinics around the world using this psychoactive substance to treat addiction as well as other mental disorders. This was in the 1990’s. Howard Lotsof and his Ibogaine Alliance, along with ICEERS, worked to bring Ibogaine to more people. In total there were 19 recorded deaths between the period of 1990 and 2008. The reasons behind these unfortunate fatalities started to become more clear. 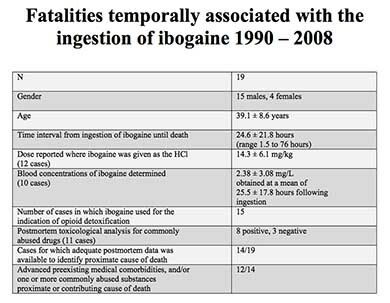 In almost every case, these Ibogaine related deaths occurred because the patient either suffered from an underlying medical condition, or was taking Ibogaine with illegal drugs in their system that contributed significantly to the cause of death. This research, done by ICEERS and Lotsof, gave us the much safer version of Ibogaine treatment we have today. Now, with advanced prescreening techniques, Ibogaine treatment has never been safer. This does not mean the risk has been completely eliminated. 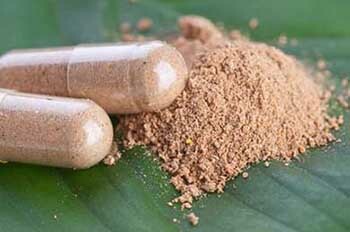 Individuals taking Ibogaine should educate themselves and be completely aware of the risks associated with Ibogaine treatment. However, with more testing and more scientific study, Ibogaine will continue to become a much safer and better understood drug treatment option. Today, Ibogaine treatment continues to gain momentum as an alternative to traditional drug rehabilitation in the USA. 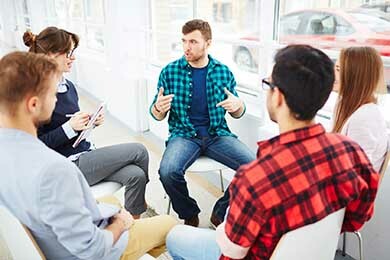 Because of the staggeringly low success rate of traditional rehab, many addicts and their families are turning to new, alternative methods in order to combat heavy withdrawal symptoms and the extremely addictive nature of heroin, opiates, and other drug addictions. Ibogaine treatment works on two different levels to treat addiction and withdrawal symptoms. The first level is the physical. 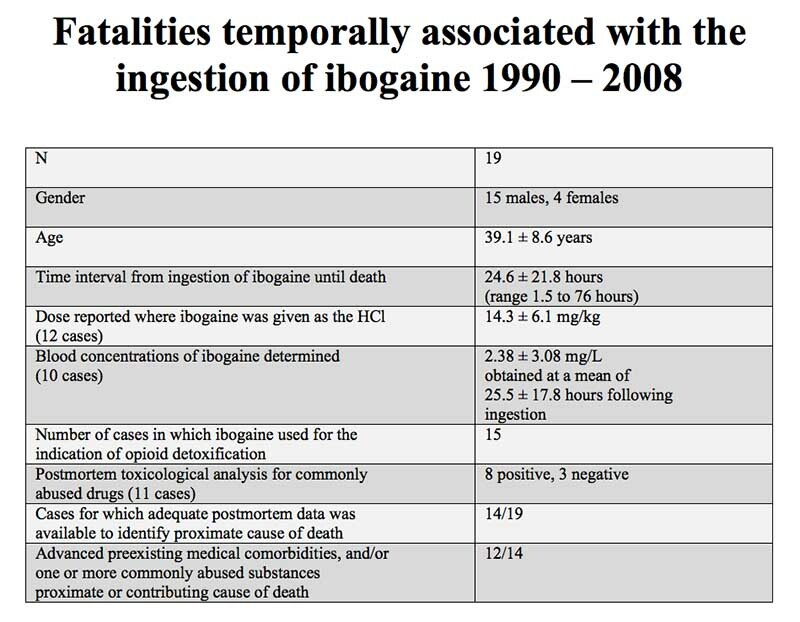 Ibogaine targets the brain and heals damage done by drug use. The second level is the psychological. Many of those who use Ibogaine go through an intense psychedelic experience that can often lead to massive therapeutic breakthroughs. On the physical level, Ibogaine works to eliminate heroin, opiate, and other withdrawal symptoms at the source–the brain. As the Ibogaine works, the brain chemistry is, in essence, reset back to its pre-addicted state. Ibogaine targets and heals neurons in the brain that have been damaged due to drug use. For heroin and short-acting opiates, Ibogaine can be used at the peak of withdrawal to eliminate these harsh symptoms. For other drug addictions, Ibogaine is taken after the drug has left the system and helps to promote healing and regeneration inside the neurological structure of the brain. This is why Ibogaine is unprecedented when it comes to addiction treatment. Other treatment methods do not, and cannot, treat the addiction at the source. Ibogaine is able to target the physical damage that has been done to the brain and reset the chemical balance that has been disrupted by drug use. Often, the physical withdrawal symptoms from stopping drug use are so severe that addicts cannot stay off of these drugs. This is the reason so many addicts stay addicted–the pain of withdrawal is too intense. Ibogaine gives addicts a much needed head start in their recovery by eliminating the majority of these withdrawal symptoms. On a psychological level, the majority, although not all, of those who take Ibogaine will experience an intense psychedelic “trip.” During this phase of treatment, many addicts report being put face to face with past trauma and negative experiences throughout their life. They are often able to view these experiences through with a more accepting state of mind, which helps many addicts deal with these past issues and move forward. These past experiences can often be the root cause of the addiction. By dealing with them in a positive way, Ibogaine helps the addict face with their past and find new meaning in life–a reason to move forward in a more positive way. This psychological healing, along with the physical healing, is what sets Ibogaine apart from other drug treatment methods. Although Ibogaine has some great attributes, there are some common misconceptions about Ibogaine that are still being spread today. Unfortunately, many of this false information is being spread by the very Ibogaine clinics that treat addiction. Ibogaine eliminates cravings – One common misconception is that Ibogaine eliminates drug cravings. Cravings are different from withdrawals. Withdrawals happen while the individual is physically readjusting to a life without drugs. Ibogaine targets withdrawal. However, cravings are psychological and come from an individual’s deep desire to use drugs. Cravings cannot be controlled by Ibogaine. If an addict wants to use, they will often find a reason to use. Ibogaine cannot force an addict to change. If an addict desires, or craves, using drugs or alcohol, they most certainly will. Everyone who takes Ibogaine will have a psychedelic experience – Another common misconception is that everyone who takes Ibogaine will “trip.” This is not true. 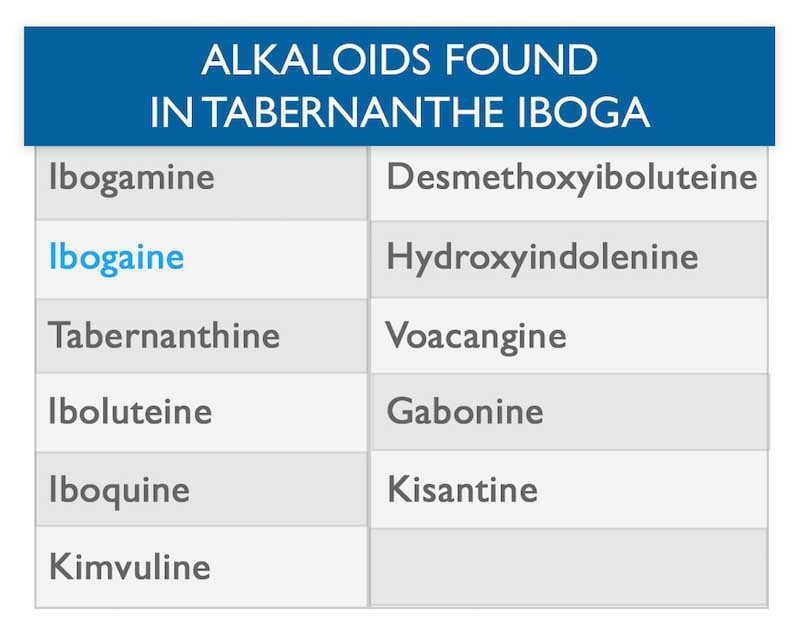 Because Ibogaine is just one of the alkaloids found in the Iboga plant, the results of how Ibogaine affects the brain can vary. From our experience, about 75 percent of those who take Ibogaine have a psychedelic experience. A portion of these will not remember the psychedelic experience they have. It is important to understand that Ibogaine may not induce a psychedelic experience. That is why those searching for psychological healing are often better off using Ayahuasca or raw Iboga first before trying Ibogaine (unless they are more concerned about being in the medical environment that Ibogaine clinics offer). Ibogaine treats depression and mental health issues – Some are under the impression that Ibogaine is a cure all for most issues. 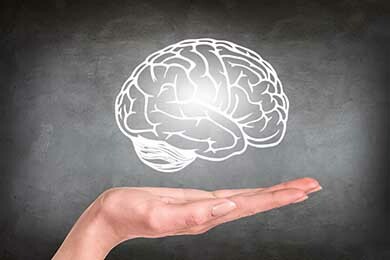 Ibogaine can help promote healing in the brain, which can often lead to breakthrough changes that help those suffering from depression and mental health issues. However, Ibogaine does not always work to heal these issues specifically. In some cases, Ibogaine can exacerbate long standing mental health issues. It is important to understand this when making a decision about Ibogaine treatment for mental health. Ibogaine is a cure – Although Ibogaine can be very effective, many individuals, especially parents, have an higher expectations than Ibogaine can offer. Although the psychedelic experience can help an individual change, it is not likely that someone who does not want to change will change with Ibogaine. Ibogaine can help facilitate major change in an addict. However, if the addict does not want to change, they most likely will not. Ibogaine has no side effects – Some individuals are under the impression that, after Ibogaine treatment, they will feel completely normal. This is not always the case. For most, the after effects of Ibogaine are heavy fatigue and slight depression that goes away after a few days. However, some individuals will experience trouble sleeping, longer bouts of depression, a general hazy feeling, and other side effects from Ibogaine. This is rare, but can be a reality. It is important to understand that it may take longer than you expect to get back on track after Ibogaine treatment. Life is easier after Ibogaine – Once again, many are led to believe that Ibogaine will make their life simple after addiction. The reality is, life after addiction is much harder than it was while being addicted. Often, the biggest struggle of addicts is facing boredom and the mundane day to day that comes with living a sober life. With proper planning, life can be rich and full after Ibogaine treatment. But the individual must be responsible for making this happen, the Ibogaine experience only lasts a few hours, the addict must go on living a sober life for years after Ibogaine. With Ibogaine being illegal to possess in the United States, those looking for Ibogaine treatment often travel to countries like Mexico, Canada, Bahamas, or other locations in order to experience Ibogaine treatment. There are also many organizations, like ICEERS and MAPS, that are currently funding studies into psychedelic medicine on almost every level. The future of Ibogaine is unclear, but one thing is certain: if Ibogaine works, it will continue to gain momentum, especially for those seeking freedom from addiction. There are currently no major US based studies into exactly how Ibogaine works in the brain, and, without proper testing, the idea of an America with legal Ibogaine treatment is almost impossible. But Ibogaine works. It has some of the highest success rate statistics of any treatment available. There is still hope for legal status and scientific study in the US, however, the reality is, this probably won’t be happening anytime soon.